Join us on a walk through time and learn about the history of Mt. 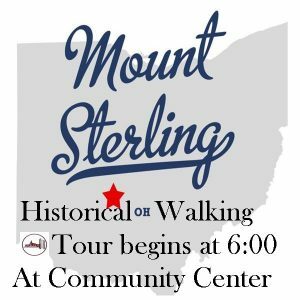 Sterling and its finest buildings on Thursday, September 21, beginning at 6:00 p.m.
Meet at the Mt. Sterling Community Center. Walking tour will conclude at the Community Museum with a visit inside. A 1-1/2 mile walk through the town and its outskirts for an educational and information guided tour.